CHRISTCHURCH, New Zealand - Some screamed from inside collapsed buildings. One woman used her mobile phone to call her children to say goodbye. Others tapped on the rubble to communicate with those on the outside. Search teams used their bare hands, dogs, heavy cranes and earth movers Wednesday to pull 120 survivors from the rubble of a powerful earthquake in one of New Zealand's largest cities. Officials raised the death toll to at least 75, with 300 others listed as missing. As rescuers dug through the crumbled concrete, twisted metal and huge mounds of brick across Christchurch, officials feared that the death toll could rise further, ranking the 6.3-magnitude earthquake among the island nation's worst in 80 years. "There are bodies littering the streets, they are trapped in cars, crushed under rubble and where they are clearly deceased our focus ... has turned to the living," police Superintendent Russell Gibson said. The United States is already responding to New Zealand's calls for help, CBS News correspondent Celia Hatton reports. More than 70 American rescue workers are travelling to Christchurch. Prime Minister John Key said at a news conference that 75 people were confirmed to have been killed, with 55 of them identified. He declared a state of national emergency, giving the government wider powers to take control of a rescue and recovery operation that was growing by the hour. Earlier, after rushing to the city, Key said, "We may well be witnessing New Zealand's darkest day." Rescuers are concentrating on at least a dozen buildings that collapsed or were badly damaged. In one of the worst, a camera inserted into the rubble showed images of people still alive, Christchurch Mayor Bob Parker said. He said 120 people were rescued from wrecked buildings, while more bodies were also recovered. Some survivors emerged without a scratch, while others had to have a limb amputated before they could be freed. Military units patrolled near-empty streets disfigured by the huge cracks and canyons created in Tuesday's earthquake, the second powerful temblor to hit the city in five months. The quake toppled the spire of the city's historic stone cathedral and flattened tall buildings. "People were covered in rubble, covered in several tons of concrete," said web designer Nathaniel Boehm, who was outside on his lunch break when the quake struck just before 1 p.m. He saw the eaves of buildings cascade onto the street, burying people below. "It was horrific." Mall worker Tom Brittenden told of how he had helped pull victims from the rubble in the immediate aftermath of the quake. "There was a lady outside we tried to free with a child," Brittenden told National Radio. "A big bit of concrete or brick had fallen on her and she was holding her child. She was gone. The baby was taken away." 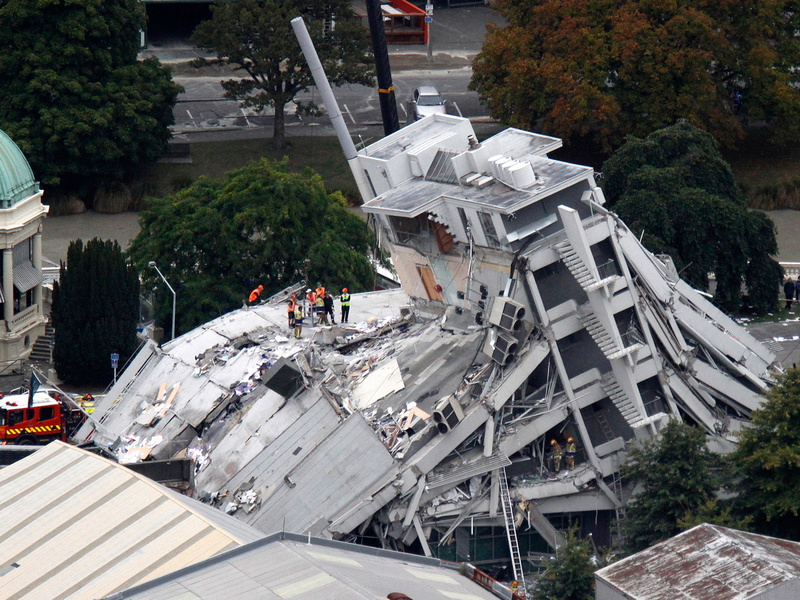 The multistory Pyne Gould Guinness Building, housing more than 200 workers, collapsed. Rescuers, many of them office workers, dragged severely injured people out. Many had blood streaming down their faces. Screams could be heard from those still trapped inside. The earthquake knocked out power and telephone lines and burst pipes, flooding the streets with water. Firefighters climbed ladders to pluck people trapped on roofs of office towers to safety. Plumes of gray smoke drifted into the air from fires burning in the rubble, and helicopters used giant buckets to drench them with water. The quake even shook off a massive chunk of ice from the country's biggest glacier some 120 miles east of Christchurch. Christchurch's airport reopened for domestic flights on Wednesday. Military flights were being added to move tourists to other cities. Thousands of people in the city moved into temporary shelters at schools and community halls. Others, including tourists who had abandoned their hotels, huddled in hastily pitched tents and under plastic sheeting as drizzling rain fell, while the Red Cross tried to find them accommodation. Parker said 300 people were listed as missing but cautioned that they did not know the number trapped in collapsed buildings. More than 400 rescue workers were joining the search, including teams from Australia, Singapore, Taiwan, the United States and Britain. Some who were trapped were able to call out using their mobile phones, reaching family, officials and media. "I rang my kids to say goodbye," said Ann Voss, interviewed by TV3 from underneath her desk where she was trapped in a collapsed office building. "It was absolutely horrible. My daughter was crying and I was crying because I honestly thought that was it. "You know, you want to tell them you love them don't you?" Voss said she could hear other people still alive in the building and had called out to them and communicated by knocking on rubble. Superintendent Dave Cliff told reporters Wednesday that anyone found on the streets in a cordoned-off area of downtown after 6:30 p.m. local time would be arrested. He says the area is too dangerous because buildings weakened by Tuesday's temblor could by toppled by aftershocks still rumbling through the city. Officials have urged the city's 350,000 residents to stay home unless absolutely necessary during the initial stage of the emergency. A more powerful 7.1 magnitude earthquake hit Christchurch, a city of 350,000, on Sept. 4, but caused no deaths. The latest one was deadlier because it was closer to where people live and work, centered 3 miles from the city, and shallower, experts say. The U.S. Geological Survey said the quake was an aftershock from September's temblor. A strong aftershock in December caused further damage to buildings. The city was still rebuilding from those quakes when Tuesday's hit.